Sylvinho’s last-minute screamer away to Chelsea in 2000 will always be the overarching memory of any Arsenal fan when it comes to the Brazilian left-back. But ultimately in the wider scale of things, as good as that goal was, the point that it rescued has little significance in the history of the Gunners. The same can be said of the player himself. Arriving from Corinthians in June of 1999 for £4 million, Sylvinho certainly caused some excitement among the ranks of the Arsenal faithful. Brought in by Arsene Wenger as the long-term successor to Nigel Winterburn, the marauding left-back took little time to make an impact at Highbury, dislodging the aging Englishman by the turn of the millennium. Sylvinho had it all in his locker: pace to burn, a never-ending engine that would see him get up and down the flank all day long. He could attack, defend, and made the overlapping run look like an art form. He was very much the modern full-back, the antithesis to Winterburn and Lee Dixon; the future of Arsenal. 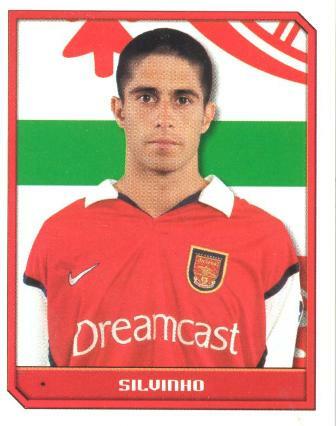 By the end of his first season, Sylvinho had racked up 46 appearances for the Gunners and had started a UEFA Cup final, back when it was still a half-respected competition. Wenger had worked his magic again, the Brazilian was an outstanding signing. With a years’ experience under his belt, the next campaign was all set up for Sylvinho to truly make a name for himself, if he hadn’t already. Yet by August 2001, just two years after he had arrived, the full-back had been shipped off to Celta Vigo, and a young man named Ashley Cole had established himself as first-choice left-back for both Arsenal and England. Four games into the new 2000-01 season, though, things were looking good. Sylvinho had just struck that aforementioned goal – his finest, and most iconic, moment in an Arsenal shirt. If you were still looking for a sign that this player was really the true heir apparent to Winterburn, then nearly four years earlier, at the same end of Stamford Bridge, the Gunners’ left-back for the day had also hit a similar last-gasp thunderbolt. This Brazilian could not put a foot wrong. However, towards the end of that season he would go on to pick up an injury, allowing the impressive Cole to take advantage with a seven-game run in the side. And the Englishman never looked back. By the summer, Sylvinho was sunning it up in Spain, permanently, with Arsenal forced to flog him due to issues with his passport. The Gunners always denied that he had entered the country to sign for them on a forged Portuguese passport, but, when authorities in Lisbon said they had no records of his dual Portuguese nationality, he was swiftly moved on by the club – safe in the knowledge that Cole would be around to become the side’s first choice left-back for the next 15 or so years. Sylvinho was a truly strange signing in a sense. He did everything that a manager or fan could ever ask for from a player, yet due to circumstances outside of his control, one minute he was at Highbury, the next he was gone. The Brazilian would have the final say, however, as he was a non-playing member of the Barcelona squad that defeated Arsenal in the 2006 Champions League final – a match that also happened to be Cole’s last for the Gunners. This entry was posted in The Samba Series and tagged arsenal, samba series by The False Nine. Bookmark the permalink.